Business US Highway 41 (Bus. US 41) was a state trunkline highway that served as a business loop off US 41 and M-28 in Marquette, Michigan, along Washington and Front streets. The streets serve the downtown area of Marquette and are bordered by several commercial properties and businesses. Those two streets originate with the early founding of the city in the middle of the 19th century. Jurisdiction over them was transferred to the city as part of a highway swap that resulted in the decommissioning of the trunkline in 2005. It was also previously co-designated Bus. M-28, mirroring the Bus. US 41/Bus. M-28 designation previously used along Bus. M-28 in Ishpeming and Negaunee. Washington and Front streets had been a part of the state highway system since the 1910s, and a part of the United States Numbered Highway System since 1926. The business loop designation dates back to the 1960s and was removed in 2005. The western terminus of Bus. US 41 was the west end of Washington Street at the intersection with US 41/M-28 near the western Marquette city limits. The intersection features a stoplight to allow traffic from eastbound US 41/M-28 to cross the westbound lanes of the main highway to access Washington Street; the remaining connections are made through stop-sign-controlled access lanes. Running eastward, Washington Street is four lanes, divided by a center median for about 300 yards (270 m) before a center turn lane replaces the median. The street is bordered by several commercial developments. There is a stoplight for the intersection with McClellan Avenue as the business loop runs uphill toward downtown. A few blocks east past other businesses and restaurants, Washington intersects the southern end of Lincoln Avenue at another stoplight. East of this junction, the roadway narrows to one lane in each direction with a center turn lane. Washington Street turns to the southeast and heads downhill in the next block, which is bordered by some houses on the north side. The turn lane drops by Seventh Street as the street passes Harlow Park. From the park east, the business loop entered the downtown area. Each side of the street is bordered by retail shops, restaurants and other service providers. Washington Street passes the federal building containing the post office and federal courthouse at the intersection with Third Street. At Front Street, Bus. US 41 turned south one block away from Lake Superior; Front Street is also a commercial section of downtown. The street passes Father Marquette Park which is named for the city's namesake, Jacques Marquette. The roadway climbs a hill headed southbound next to the park. Bus. US 41 ended where US 41 turns south along Front Street at the east end of the Marquette Bypass. At the time the business loop was still under state control, it was maintained by the Michigan Department of Transportation (MDOT) as a segment of the State Trunkline Highway System. As a part of these maintenance responsibilities, the department tracked the volume of traffic that used Bus. US 41. These volumes were expressed using a metric called annual average daily traffic, which is a statistical calculation of the average daily number of vehicles on a segment of roadway. In the department's last survey, conducted in 2004, there were 10,272 vehicles per day using Washington Street between Lincoln Avenue and Front Street, the lowest traffic count for the trunkline. The highest volume was 19,036 vehicles between McClellan and Lincoln Avenues, while the Front Street section received 16,309 vehicles on an average day. The former business loop has not been listed on the National Highway System, a network of roads important to the country's economy, defense, and mobility. Marquette's founding settlers arrived in the area on May 18, 1849, to establish the community, and the original thoroughfares were platted by 1855, including Washington and Front streets. The widest street in the city at 100 feet (30 m), Baraga Avenue was intended to be the Marquette's main street when the downtown area was originally laid out, but businesses centered their locations along Washington Street instead. The community was incorporated as a village in 1859, and it was later reincorporated as a city on February 21, 1871. The original city hall was built in 1895 on Washington Street, and in 1910, the city started paving its streets, replacing wooden planks with asphalt. A state highway was routed through downtown starting on May 13, 1913, when the system was created. It was first a part of M-15 when the highway system was signed in 1919, and then later as US 41/M-28 after the creation of the United States Numbered Highway System in 1926. 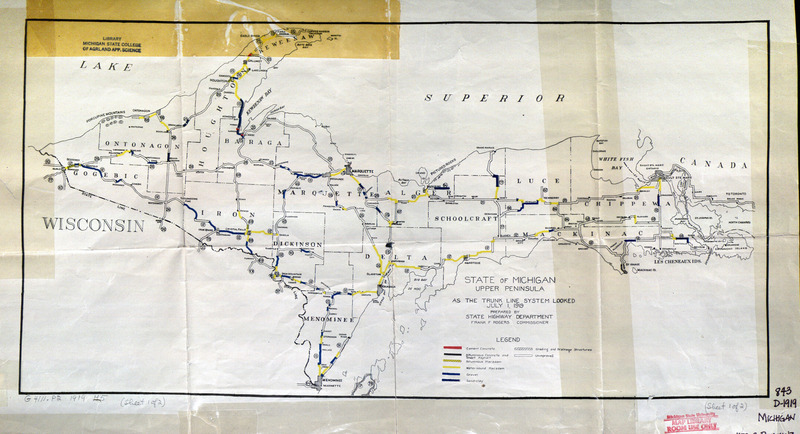 (Under the original 1925 draft plan for the U.S. Highway System, US 102 was the number assigned to run through Marquette.) The streets have been paved since at least the 1920s. The Marquette Bypass opened on November 21, 1963, and the business loop was marked for the first time on the 1964 state highway map. A Bus. M-28 designation was added to the route for the 1975 state map, marking it similar to the Bus. US 41/Bus. M-28 designation that was previously assigned along Bus. M-28 in Ishpeming and Negaunee. This second designation was removed by 1981. Marquette received $2.5 million (equivalent to $3.2 million in 2018) in state funding for improvements to Washington Street near downtown as a part of the transfer agreement. The city also assumed responsibility for maintaining the stoplights installed along the former highway. These improvements rebuilt Washington Street from 5th Street westward during 2007. The roadway was narrowed from four lanes to two with a center turn lane between Lincoln Avenue and 7th Street. The speed limit was reduced from 35 to 25 mph (55 to 40 km/h) along the street to deal with the traffic that turns into and out of businesses. In 2010, the intersection between Front Street and the eastern end of the Marquette Bypass was converted into a roundabout configuration, opening to traffic on August 19. The entire highway was in Marquette, Marquette County. ^ The Ramada of Marquette uses "Business 41" on their billboards and even includes it in directions to their hotel. The Admissions Office at Northern Michigan University does the same as well. ^ a b "Bypass to Cut Travel Time by 20 Minutes". The Mining Journal. Marquette, MI. November 20, 1963. p. 13. ISSN 0898-4964. OCLC 9729223. ^ a b Garner, Dawn (November 9, 2005). "MDOT and City of Marquette Complete Jurisdictional Transfer" (Press release). Michigan Department of Transportation. Archived from the original on March 14, 2007. Retrieved July 31, 2008. ^ a b Michigan Department of Transportation (2001). "Marquette County" (Map). Control Section/Physical Reference Atlas. Scale not given. Lansing: Michigan Department of Transportation. OCLC 52464372. ^ a b Michigan Department of Transportation & City of Marquette (October 10, 2005). "Memorandum of Understanding". Michigan Department of Transportation. ^ a b Michigan Department of Transportation (2004). Michigan: Official Department of Transportation Map (Map) (2003–2004 ed.). c. 1:190,080. Lansing: Michigan Department of Transportation. Marquette inset. OCLC 42778335, 53197160. ^ a b Google (August 14, 2008). "Overview Map of Former Bus. US 41" (Map). Google Maps. Google. Retrieved August 14, 2008. ^ Bureau of Transportation Planning (2008). "Traffic Monitoring Information System". Michigan Department of Transportation. Retrieved April 24, 2011. ^ Natzke, Stefan; Neathery, Mike & Adderly, Kevin (June 20, 2012). "What is the National Highway System?". National Highway System. Federal Highway Administration. Retrieved July 31, 2012. ^ Diem, Christopher (May 18, 2009). "A Glimpse of the Past: Sunrise Re-Enactment Honors Marquette's Founders". The Mining Journal. Marquette, MI. p. A1. ISSN 0898-4964. OCLC 9729223. Archived from the original on July 25, 2012. Retrieved July 25, 2012. ^ Brooks, A. & Chamberlain, J.G. (1855). Map of Iron Bay and the Village of Marquette (Map). 1:1,440. Marquette, MI: Cleveland and Sharon Iron Companies. OCLC 28982382. ^ Longtine, Sonny & Chappell, Laverne (1999). Marquette: Then and Now. Marquette, MI: North Shore Publications. p. 67. ISBN 0-9670793-0-6. OCLC 42775596. ^ a b Central Upper Peninsula and NMU Archives (n.d.). "Marquette Historical Timeline". Northern Michigan University. Archived from the original on August 20, 2012. Retrieved July 25, 2012. ^ Rydholm, C. Fred (1989). Superior Heartland: A Backwoods History. Vol. 1. Ann Arbor, MI: Braun-Brumfield. p. 208. ISBN 0-9639948-2-4. LCCN 89-90710. OCLC 20652946. ^ Michigan Legislature (1915) [enacted May 13, 1913]. "Chapter 91: State Reward Trunk Line Highways". In Shields, Edmund C.; Black, Cyrenius P. & Broomfield, Archibald (eds.). The Compiled Laws of the State of Michigan. Vol. 1. Lansing, MI: Wynkoop, Hallenbeck, Crawford. pp. 1868–72. OCLC 44724558. Retrieved January 24, 2012. ^ Joint Board on Interstate Highways (1925). "Appendix VI: Descriptions of the Interstate Routes Selected, with Numbers Assigned". Report of Joint Board on Interstate Highways, October 30, 1925, Approved by the Secretary of Agriculture, November 18, 1925 (Report). Washington, DC: United States Department of Agriculture. p. 52. OCLC 733875457, 55123355, 71026428. Retrieved November 14, 2017 – via Wikisource. ^ Michigan State Highway Department (1964). Official Highway Map (Map). [c. 1:918,720]. Lansing: Michigan State Highway Department. § C6. OCLC 12701120, 81213707. ^ Michigan Department of State Highways and Transportation (1975). Michigan, Great Lake State: Official Transportation Map (Map). c. 1:190,080. Lansing: Michigan Department of State Highways and Transportation. Marquette inset. OCLC 12701177, 320798754. ^ Marquette County Road Commission (1939). Marquette County (Map). Scale not given. Ishpeming, MI: Marquette County Road Commission. ^ Marquette County Road Commission (1950). Marquette County (Map). Scale not given. Ishpeming, MI: Marquette County Road Commission. ^ Michigan Department of Transportation (1980). Michigan, Great Lake State: Official Transportation Map (Map) (1980–1981 ed.). c. 1:190,080. Lansing: Michigan Department of Transportation. Marquette inset. OCLC 12701177, 606211521. ^ Michigan Department of Transportation (1981). Michigan, Great Lake State: Official Transportation Map (Map) (1980–1981 ed.). c. 1:190,080. Lansing: Michigan Department of Transportation. Marquette inset. OCLC 12701177, 606211521. ^ a b "Road Shift with State Well-Planned". The Mining Journal (Editorial). Marquette, MI. April 27, 2005. p. A6. ISSN 0898-4964. OCLC 9729223. ^ Swanson, Scott (April 26, 2005). "Washington Reconstruction: City To Get $2.5 Million". The Mining Journal. Marquette, MI. p. A1. ISSN 0898-4964. OCLC 9729223. ^ Iron Ore Heritage Recreation Area (2010). Iron Ore Heritage Trail Official Map and Trail Guide (Map). Scale not given. Marquette, MI: Iron Ore Heritage Recreation Area. Marquette–Chocolay inset. ^ Marquette County Convention and Visitors Bureau (2015). Tourist Map of Marquette (Map). Scale not given. Marquette, MI: Marquette County Convention and Visitors Bureau. ^ Ramada of Marquette (2014). "Ramada of Marquette: Maps and Directions". Ramada Worldwide. Retrieved September 29, 2015. ^ Admissions Office (2015). "Directions to NMU". Northern Michigan University. Retrieved September 29, 2015. ^ Diem, Christopher (January 3, 2008). "Washington Street Reactions". The Mining Journal. Marquette, MI. p. A1. ISSN 0898-4964. OCLC 9729223. Archived from the original on April 29, 2012. Retrieved April 29, 2012. ^ Diem, Christopher (August 19, 2010). "New Roundabout Celebrated with Ceremony". The Mining Journal. Marquette, MI. p. A1. ISSN 0898-4964. OCLC 9729223. Archived from the original on February 3, 2011. Retrieved September 11, 2010. Wikimedia Commons has media related to Bus. US 41. This page was last edited on 12 August 2018, at 05:52 (UTC).